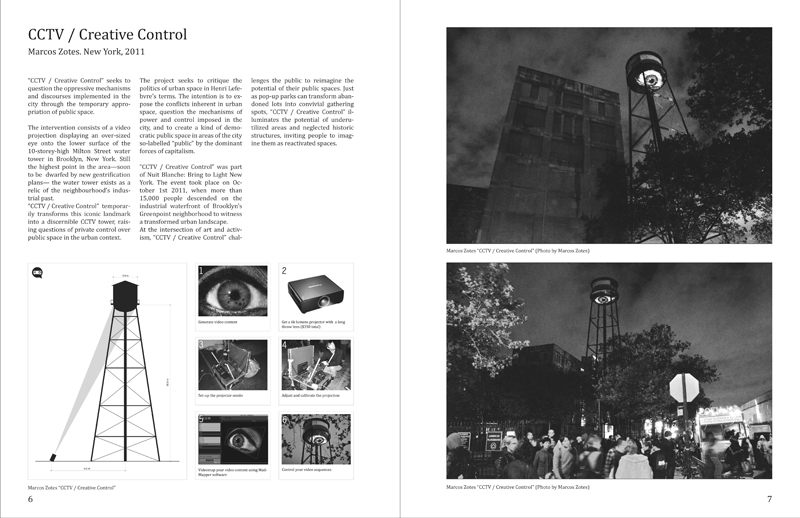 “Projection as Urban Activator” explores the medium of light projection on urban public space as a means to question the oppressive mechanisms and discourses implemented in the city. The work focuses on exploring notions of appropriation, subversion and activation of public space. 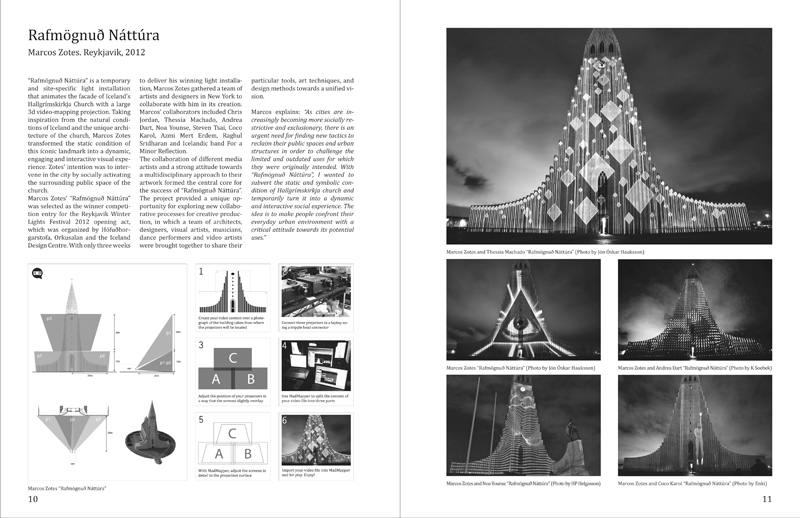 By actively engaging in experimentation, the research process is carried out through a series of public interventions in different urban conditions. The aim is to explore contemporary issues of identity (personal and collective), communication (expression of the self), and autonomy (moments of antagonism), through the temporary appropriation of public space, whether spatial, temporal, and psychological. By intervening the everyday order of contemporary urban life, these experiments aim at creating moments of antagonism—however transitory, fragmentary and ephemeral these might be. 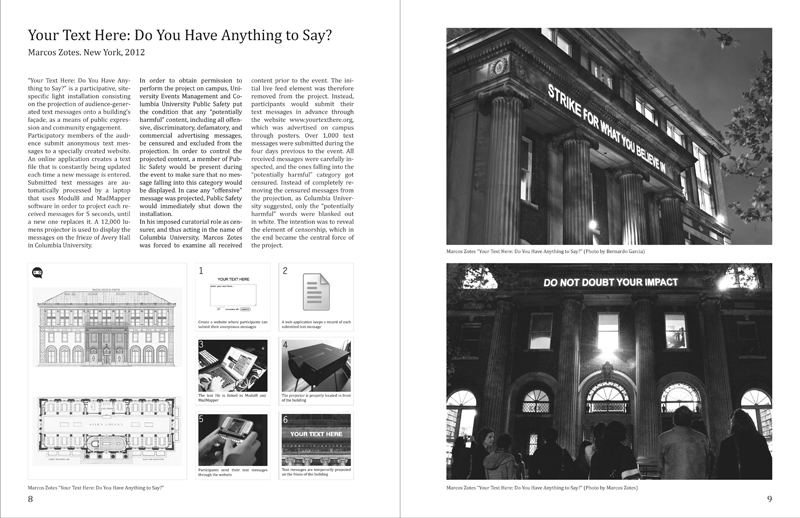 The research project takes the form of a manual, a “User’s Guide” type of document that aims at offering new ways to practice the city, not simply as consumers but as creators. In his 1960s theory on the Right to the City, or the right to appropriation, French philosopher Henri Lefebvre advocates for the right to use urban space so that it not only meets the needs of its inhabitants, but it also provokes a certain awareness for change. For Lefebvre, urban space needs to be contested through appropriation in order to define new and socially inclusive uses for the city. For Pierre Bourdieu, symbolic subversion is the act of deconstructing and reconstructing meaning. Symbolic subversion facilitates whole new patterns of association between elements of the city, power relations, and individual’s beliefs, which is the way for political awareness. If in a hegemonic order these items seem not to connect, the act of symbolic subversion renders them explicitly connected. To activate public space is to set in motion certain aspects of the public, social, political, cultural, and economic spheres of the city. 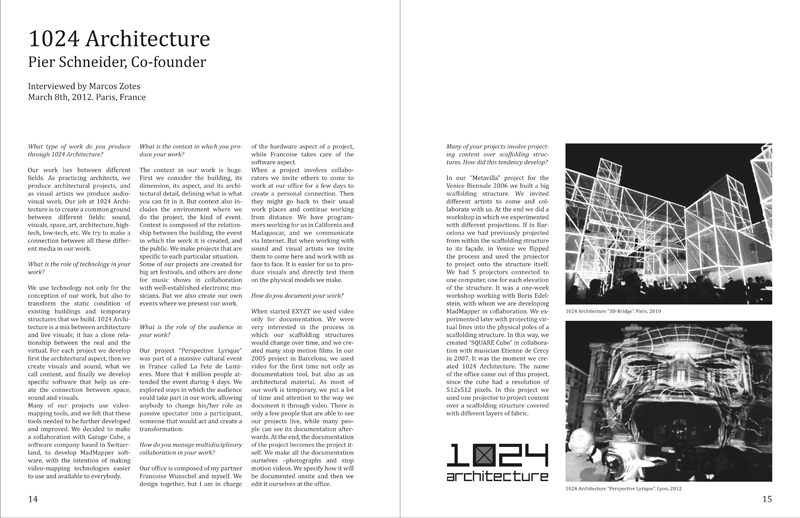 The aim is to generate or accelerate a particular reaction in the users of a particular urban space, in order to produce new meanings for theses spaces—temporal or permanent. 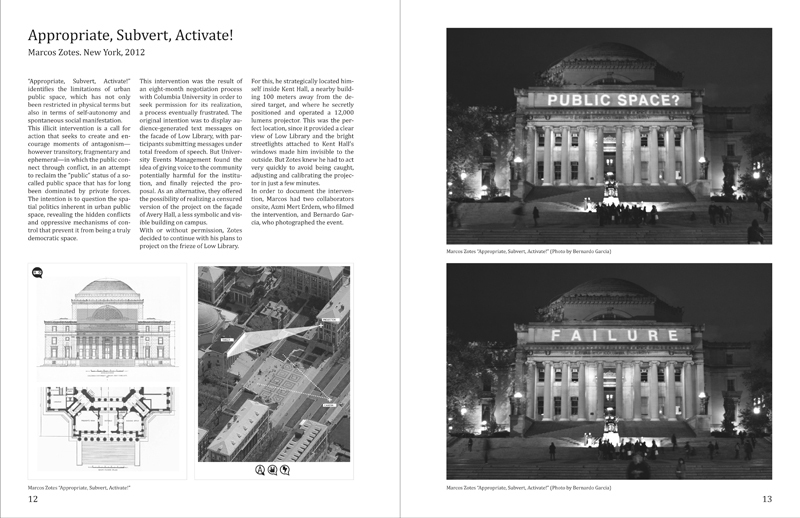 "Appropriate, Subvert, Activate! 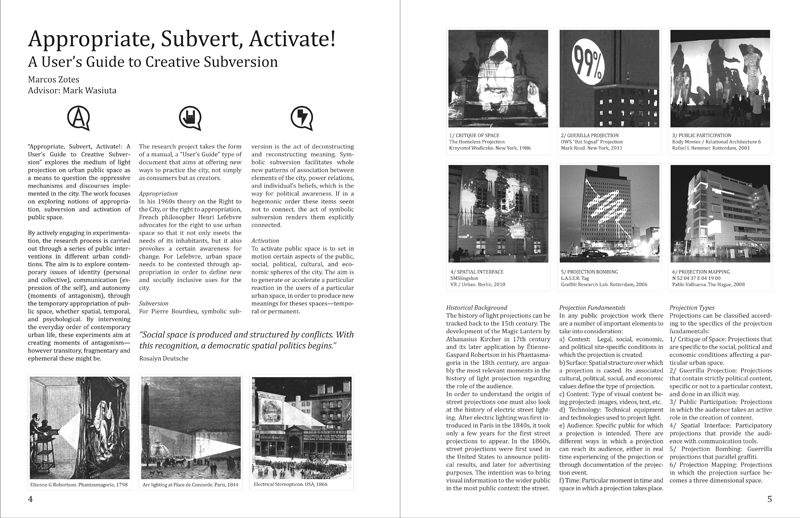 A User's Guide to Creative Subversion"